This is an elaboration for those seeking to learn more about ants (and copied from an older forum post here). For a quick lesson on Ant Anatomy see here. To Identify to Subfamily (above Genus and species level) consider reading "Ants of North America" by Brian L. Fisher and Stefan P. Cover. There is also a key available online at Ants of South Eastern United States for subfamily level. Though not an expert this is my take on identifying ants to subfamily leve. A lot of the ants are in 1 of the 4 main subfamilies. North America has 10 ant subfamilies total. Myrmecos.net has them arranged beautifully but not all of them are present. The four most common subfamilies are Myrmicinae, Ponerinae, Formicinae, and Dolichoderinae. The lesser found ones are Amblyoponinae, Cerapachyinae, Ecitoninae, Ectatomminae, Proceratiinae, and Pseudomyrmecinae. All of the genera in each group have their own survival tactic and body shape. Please disregard color entirly until you're ready to identify an ant to species level (even then it's not always helpful). Let's get the lesser ones out of the way first. Ectatomminae is unique for North America because there is only one introduced genus, Gnamptogenys which has only two species in it. Notice the groves all over the body, the curved mandibles, how hard it is to tell if that's two waist segments or a malformed abdomen. Pseudomyrmecinae is another one easy to ID because of how unique the ants look. The genus Pseudomyrmex is a good representative. Notice the huge eyes compared to the size of the head, the long slender bodies, two waist segments, and the fact that nearly all of them are associated with a plant. They are also known for having a painful sting so be careful. Amblyoponinae and Cerapachyinae I don't know a whole lot about. They are rarely found except by experts. Both look similar to the subfamily Ponerinae. They all have a poorly defined second waist segment. Amblyoponinae tend to be specialized predators (see Amblyopone), they have a stinger, and mandibles with well defined teeth. Cerapachyinae I'm not even going to attempt to summarize. Genera in this group are cryptic, unknown, and I believe have only been found a dozen times or less between California and Texas. And now onto the big four. Identifying these deserves a topic in itself. 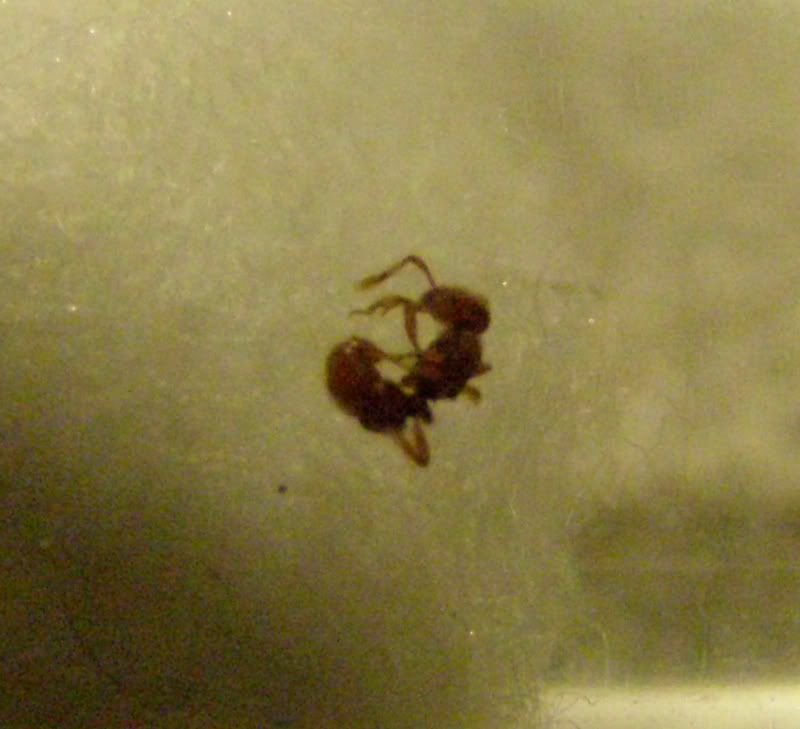 Myrmicinae, always have two waist segment! They have also adapted the ability to consume starch, Seeds! These are all your Aphaenogasters, Monomorium, Temnothorax, Tetramorium, Myrmica, Solenopsis, Messor, Pogonomyrmex, Pheidole! and so on. These are some of the largest genera in North America. They are our harvester ants and scavengers. Very diverse group of ants. They are also our Fungus growing ants: Atta, Acromyrmex, and Trachymyrmex. They have stingers but cannot spray acid, nor do they produce odors. The closest thing they have to projectile warfare is Crematogaster using their flexible stinger like a paint brush to paint venom onto the enemy. Ponerinae, these are the more common discrete foragers you'll find. The genus Ponera is a good representative. Though they appear to have one waist segment, I believe technically they have two. The one well defined waist segment they have is actually bulky and almost as large as the abdomen itself. The abdomen to most of these ants usually has an odd segment that allows it to be more flexible. (Boloponera is a good example of this but not found in North America) Queens in this group tend to be worker-like but can be different in size somewhat. Formicinae, always have one waist segment! They have evolved to consume and store sugary foods. These are all the Prenolepis, Lasius, Formica, Camponotus, Brachymyrmex, Paratrechina, Myrmecocystus, Polyergus, and so on. These are the majority of the ants you see tending aphids, visiting flowers, they're collecting nectar and have the repletes (a special caste) to store it. See Here. The plates that make up the exoskeletain of the abdomen abdomen actually expand as their social stomach swells up with food. As this happens, the inner membrane of the abdomen swells up too and pushes the plates that make up the abdomen outward. They don't sting but can spray venom, or sometimes formic acid. Spraying acid is usually done in open wounds as a secondary action to biting, but Some Formica species are known for spraying venom wildly into the air when disturbed. Some Lasius are actually called Citronella ants because they produce a lemony odor. Dolichoderinae, always have one waist segment! They have a lot in common with Formicinae because they almost look the same. The main difference listed in "Urban Ants of North America and Europe" seems to be the tip of the abdomen has no hair around it. I don't like just leaving it there though. This group includes Dolichoderus, Dorymyrmex, Forelius, Tapinoma, and one or two others. They're odorous ants, though many of them need to be squished in order to produce the odor. Like Formicinae they can also spray venom but it has more instant potency. The term "Ant Mace" comes from Forelius ants spraying directly in the eyes of other ants. Their head shape and body textures also differ from genera in the Formicinae subfamily. Once you have a good idea of what subfamily your ant is in you can potentially figure out what genus and potentially species after that. "Ants of North America" by Brian L. Fisher and Stefan P. Cover has the most complete list of ant species for North America in back of it. The book "Bringing Nature Home" works!